>> Un.Be.Lievable. 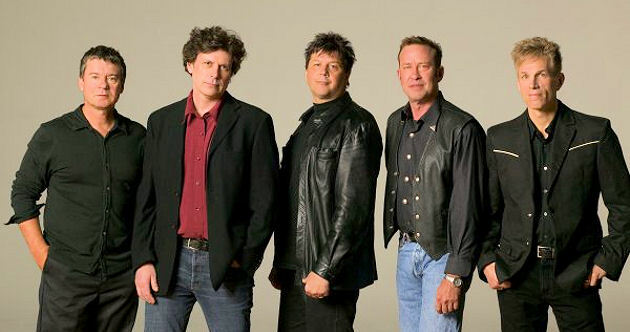 Philly-based '80s rockers The Hooters released a new record, Time Stand Still, this week. It looks like you can stream most of it at the band's MySpace dojo here (we didn't think we'd ever type the words "Hooters" and "MySpace" in the same sentence), which we just did. We don't hear pop hits, but the set has an easy folk-rock vibe with the expected but not overpowering religious references. There was a year back there in the '80s when the quintet was bigger than big. We distinctly remember being a kid getting driven to The Mall in the way back of a station wagon the year that the follow-up to Nervous Night was released and "Satellite" was on the radio. A pretty damn good song, and certainly much better than "Johnny B," which one of the articles linked supra contends is something of a phenomenon to this day in Germany. Anyway, a lot of our Hooters memories are tied into being a passenger in the car -- no surprise given our age at the time. Nervous Night was huge one summer during which we drove most every day to the cringe-inducingly affluent "swim club" to which our family belonged. And of course a car plays a prominent role in this video for "And We Danced," which Sony BMG refuses to let us embed for you no matter how amazing the short bridge to the song is. The Hooters' Eric Bazilian ended up moving into a house across the street from one of our girlfriends back in the day, if memory serves. >> Delaware-proud (Debella-ware, anyone?) indie pop septet Spinto Band -- this decade's Hooters? Man, that would probably be a hell of a touring bill -- is poised to release its eighth long-player this summer. The set is titled Moonwink, and the lads will support its release with a spring tour including the obligatory dates at SXSW, which is fun to type because all the letters are adjacent to each other. Too bad Austin isn't right next to Boston -- which would be particularly awesome not only because of access to primo Tex-Mex, but also because they rhyme. But we digress. No release date or label has been disclosed for Moonwink, according to this bit in CMJ, and the information is conspicuously absent from a presser that was flaregunned Tuesday. But we recall Philebrity reporting in Jan. 2006 [here] that Spinto Band has a 700,000 pound licensing deal with Virgin UK. So don't worry, the guys aren't starving. In fact they displayed an almost absurd degree of pep when we saw them sandwiched between Johnny Foreigner and Los Campesinos! Nov. 30 [review]. Spinto Band's most recent full-length Nice And Nicely Done was released three years ago -- or, roughly 10,000 years in so-called Internetz time -- on Bar-None. Because it never gets old, here is "Oh Mandy." >> A few words about Songerize. Is this thing brilliant or what? It is bloody drop-dead easy to use. And although it doesn't have any advanced functionality such as playlisting, that very well may be the beauty of the thing. Songerize is a pure diner jukebox with almost endless inventory -- well, endless capacity, anyway. We wanted to hear "Destroyer" by The Kinks, we typed it in and boom. Huey Lewis and The News' "Do You Believe In Love?" or Bold's "Wise Up"? Well, no dice. But The Jam's "Down In The Tube Station," voila! Sure, there is no playlisting, but for people who want to actively consume and not passively consume, it is hard to beat Songerize -- assuming the song is available. Of course, it is probably not even close to legal, but -- as one of our digital music industry pals points out -- it may be the most legal thing that embattled media search engine creator Seeqpod has created (Seeqpod is currently being sued by Warner Music Group). It is interesting to note that Songerize doesn't seem to scrape music that is made freely available through Last.FM. We punched in a few titles by smaller acts (such as Nosferatu D2's genius "A Footnote") that we know that the Viacom-backed and UK-based social music play offers for free and none of the tunes came up. >> Mobius Band is promising some form of Valentine's Day surprise. We're hoping it is a cover of Robert Palmer's "Addicted To Love." Either way, we're guessing the surprise is something the cyborg-rock trio recorded during the band's recent woodshedding in Western Massachusetts. Of course, the surprise could be anything. Time will tell. >> Uhhh, given the touring history shared between the bands, the first fellow we'd call to fix this problem if we were Kevin Shields is J. Mascis. Might be hard to fit in his schedule, as Witch is just about to release a new record and tour Europe.